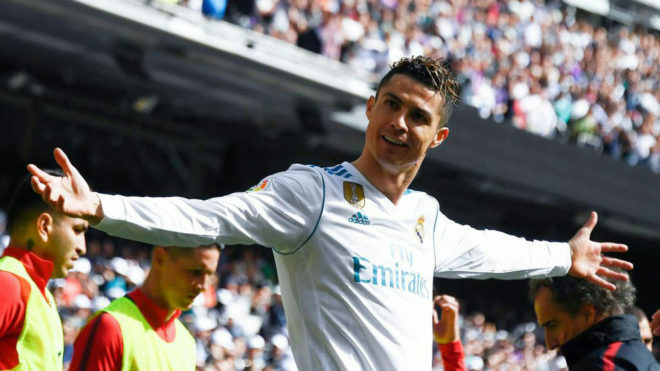 Real Madrid took the lead in the Madrid derby courtesy of Cristiano Ronaldo, who had been given a standing ovation before the game, and who was then replaced, as agreed, on the hour. Gareth Bale’s cross from the left found the Portuguese forward at the back post, and he set himself perfectly whilst the ball was in the air to be able to hit a perfectly struck volley downwards into the bottom corner. Despite a poor start to the season, Ronaldo has rediscovered his best form of late, scoring 24 goals in 15 matches, and 19 in the last nine. His goal against Atletico Madrid capped off what has been a sensational week for the former Manchester United forward. Zinedine Zidane withdrew Ronaldo after an hour and much to the surprise of the home crowd, but the substitution had been agreed to prior to kick-off.